Guernsey Post is to issue stamps to commemorate the 50th anniversary of the publication of the first Wombles book by children’s author Elisabeth Beresford, MBE (release date: 14 February 2018). The author, who lived on Alderney for over 30 years, got her inspiration for the Wombles on a Boxing Day walk when she took her young children to Wimbledon Common to let off some steam. Her daughter, Kate, mispronounced it as Wombledon Common and it was there that an idea was born. 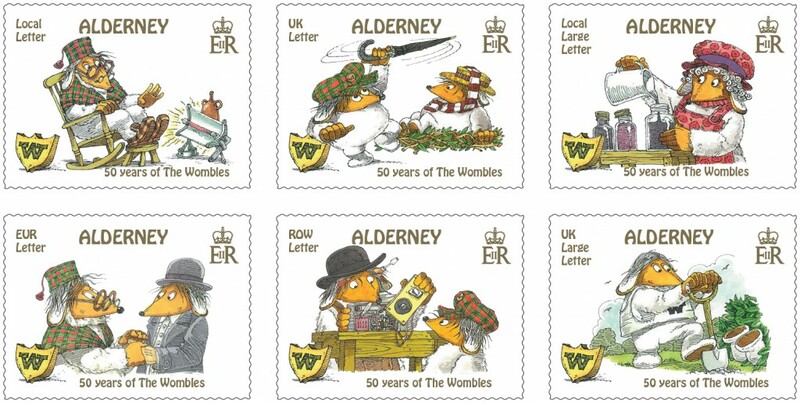 Later that day, Beresford made a list of names and based some of the Wombles characters on members of her family, six of which are depicted on the stamps. Inspired by her father-in-law is Great Uncle Bulgaria, the oldest and wisest of the Wimbledon Wombles; Tobermory is a skilled inventor and is based on Beresford’s brother; Orinoco, with his love of sleep and food, is styled on her teenage son; Madame Cholet – a prim and proper female Womble – is based on Beresford’s mother and named after Cholet, a town in France; and, Bungo, who is excitable and bursting with ideas, is inspired by her daughter. Other Wombles characters include Tomsk, who is athletic but with a rather low IQ. He is a keen golfer and plays on the London Scottish Golf Club course situated on the common. Alderney, Madame Cholet’s assistant, appeared in the earlier Wombles books and is named after the island where the author lived from 1967 and where she wrote several Wombles books. Bridget Yabsley, head of philatelic at Guernsey Post said: – “We’re absolutely delighted to commemorate the 50th anniversary of The Wombles’ first book. These wonderful characters achieved worldwide success; they were ahead of their time in recycling “things that the every day folks leave behind” and inspired children to recycle, as Beresford hoped they would. The stamp products are available to pre-order now at www.guernseystamps.com or by calling Philatelic Customer Services on +44 (0) 1481 716486.